The apartment is located in the Quinta dos Arcos part of Armacao de Pera, it is in a new build apartment block that is furnished to an exceptionally high standard. It comfortably sleeps 4/6, there are 2 air conditioned bedrooms both with 2 single beds. There is a large, luxurious living room also with air con and there are patio doors onto the balcony (with BBQ). A communal swimming pool is located on the roof of the apartment and the sea, bars and local restaurants and miles of golden sandy beach are just a short walk away. For those that play golf, they will be spoilt for choice with over 20 courses available locally. Underground secure car park is provided. Only a few minutes drive to local attractions such as Zoo Marine, Algarve Shopping and several water parks. We are Jon & Caroline, we have two daughters and we all love the Algarve and especially Armacao de Pera; The beach, the weather and the people, hence our investment in this apartment. We hope you will like to stay in our 2 bedroom air-conditioned apartment in, Armacao de Pera. I brought the apartment in 2008 (completing in Dec 2008) it has been a life long ambition for me to own a holiday home. It is also great for my young family who now love the area and the people. We look forward, to many weeks in the sun! As one of my clients said it's a real home from home! The beach is only a few minutes stroll and has over 2 miles of beautiful sandy shoreline. The rooftop pool ideal for cooling off after a long day on the beach. If you have a car, we have secure underground parking in our own designated space (oh, and it's near the access for the lift. Fully-tiled bathroom with bath, shower, WC, bidet and basin. We do have a satellite box, however, since the satellite was repositioned most of the uk channels are no longer picked up. A small selection of books left, feel free to take one (and leave one in it's place). Notes on accommodation: Air-conditioning units are installed in both bedrooms and in the lounge area. A baby sitting service can be provided (at an hourly rate) but needs to be booked prior to your arrival OR with our local agent. Outside: There is a communal swimming pool on the roof of the apartment block. This also includes a shower area and "bathroom" facilities. Cleaning / Towels / Linen / Maid service: All linen and towels are provided (sorry, not beach towels), Maid service and cleaning is done once per week but can be done more often at extra expense. Meet and greet is also available, this is a free service 8am-8pm Other: The hallway is long an spacious, the table by the front door contains the visitor book with all the info you will need to where to go in the area. There is also a few beach toys which you are welcome to borrow. We also have sun loungers and deckchairs. If you are in to water sports or Diving including obtaining your PADI accreditation, these can all be arranged locally. The apartment is only 300 to 400m from the beach so you can walk to the beach in less than 10 mins. The beach at Armação de Pera not only claims to be the longest on the Algarve, its probably the best, being one of the cleanest and least crowded beaches in the region. In addition, there is another secluded beach 1km away in the quiet village of Porches. 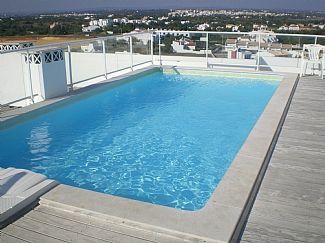 The apartment is approx 40km from Faro Airport which is around 30 mins by car. Many budget & Charter Airlines fly into Faro including; Easyjet, Monarch Airlines, British Airways & Aer Lingus. Taxis are fairly reasonable or airport transfers can be arranged at a competitive rate If required. However, should you want to hire a car there are lots of places at the airport or you can book on-line (see our website for links). Diections to the apartment will be sent proir to your arrival. Armação de Pêra has everything you need for a lovely holiday - fantastic beach, shops, supermarkets, restaurants and bars. It is also ideally placed for a day out at Zoomarine sea-life park at Guia, a trip to 'Algarve Shopping' mall, also at Guia (10 mins by bus, car or taxi) and the water parks at Alcantarilha and Lagoa. Armação de Pêra was named after the inland region of Pêra in Portugal, where the fishermen came down from originally and armação, which was a specially adapted boat, with a combined netting system, designed by the Moors. Today Armação de Pêra is a lively high-rise Algarve resort, which is very popular with Portuguese holidaymakers in the summer. It has a wonderful long sandy beach stretching all the way to Praia de Galé. Arriving on the outskirts of Armação de Pêra, there are now huge numbers of new apartments along with new roads and roundabouts to link it all together. The centre (centro) and the beach (praia) are clearly signposted, and there are several roads leading to the beach, so if you miss the first one, don't worry! There is a large area of ground at the western end where you can park and another large area at the eastern end by the fishermen's beach, along with a multi-storey by Pingo Doce supermarket. Booking Notes: A payment of 25% or £100 (€125), whichever is greater secures your booking. The balance is to be paid 6 weeks prior to your stay. A refundable damage deposit of £150 (€175) is also to be paid 6 weeks prior to arrival but the deposit should be refunded within 1 week after departure subject to nil damage. Changeover Day: Changeover day is completely flexible. Notes on prices: Prices are for the property per week in UK Pounds and an approximate value in euros. A 2nd week discount of 10% between May and September. A 2nd week discount of 20% between October & April. Discounts also available for periods between 1 and 2 weeks (i.e. 10 days) or for periods over 2 weeks. Rentals for less than 1 week are welcome and will be charged on a pro rata basis (please feel free to contact us for a quote). Long term Winter breaks also available.